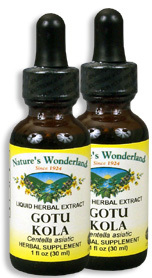 Gotu Kola Extract, 1 fl oz / 30 ml each (Nature's Wonderland) - Penn Herb Co. Ltd.
ALSO KNOWN AS: Brahmi, Centella asiatica, Hydrocotyl asiatica, Indian Pennywort, Takip-kohol, Takip-suso. Note: Gotu Kola is NOT to be confused with the stimulating Kola Nut. AMOUNT PER SERVING (666mg/ml or 30 drops): Certified Organic Gotu Kola Herb (Centella asiatica). OTHER INGREDIENTS: Grain Alcohol (45-55% by volume), Deionized Water.